As is written about them, the Sirians have been on Earth since at least the time of the early Mayan and Egyptian civilizations. Some believe that they also helped us during the period of Atlantis. Atlantis was a 5th dimensional civilization that covered most of our Earth. Sirius is also a star system of which Christed intergalactics happen to reside. I’d like to call upon the Lord of Sirius, if someone else is coming in, please identify yourself and guide us with pure intent. King Theos: I am known by many names. I myself, rather than be identified as a Lord, might be identified as a King, though not nearly like a type of earthly king or queen. It might be interesting to know that we find ourselves in a paradigm between sharing much of who we are and what we know, and also the paradigm of resharing and reshaping some of what we know and who we are with others. Therefore, this is not the first time we’ve been called upon, as she (Kelly) speaks for us, beginning about 10,000 years ago. I myself, you can call me King Theos. Ten thousand years ago, when I first arose from the sea or came from the sea, some of you might come to know me as Neptune—gods and goddesses, kings and queens of the mythological type. So, the mythology, much of what your earthly ones write about, know of, and speak or embrace, much of the early formation of gods and goddesses came from visitations not only from the Syrians, but of the Arcturians, the Lemurians, and the Marians (who were different). The Pleiadians were often doing other battles at the time. You may refer to me as Theos at the time. I will speak for all of us here in our time together and will be happy to speak of our involvement in your earthly plan and the mission we were given—and continue to be given in the healing advancement we feel we were intended to bring, we did bring—and others that lay on the horizon. Perhaps I will stop right there and talk of the healing properties of the pyramids, if I may. Perhaps even before, I would go back to some basic understanding that everything above land is also created in your inner Earth, which also has oceanographic tunnels. And more than tunnels, there are cities. So, it is not as though we are separate from your world, though many of your ships do fly over. And we like to fly over many of the no-fly zones because we can fly there undetected and intercept many of the weapons that are being housed and collected there, to help disassemble warfare, which is part of our mission on the Earth plane. It has taken different forms, but our mission is still the same: to bring the Solar System back into the vibration frequency of about a million electrons or electro-Hertz. Said in other ways, to see that the vibrational pull of the Earth is brought back into cohesion or balance, or back into unity, oneness, or sanctity, because the vibrational pull of the Earth had actually fallen outside of the Solar System. When you heard these things like the Earth was spinning faster, this is part of what 2012 was indicative of—that the vibrational pull of us helping, and many others helping, to fix the wobbly wheel. As you may be accustomed to Archangel Michael using visual analysis, I will do the same. We saw the Earth as an oval that had gotten out of round. Our mission was to bring peace, unity, and bring the planet back into unity roundness. That process still goes on, continues above ground and underneath ground in parallel universes. In speaking of the pyramids, we should be very particular about where the pyramids are and not make any assumptions. Many pyramids have not yet been discovered and lie on the ocean floor. The pyramids which were in her (Kelly’s) mind were the pyramids most commonly known, associated with and attributed to extraterrestrial life forms, and those are the ones found in what is now known as the Giza Plateau. To continue, those holographic forms, what they are to us, look like hollow forms. If the word holographic is new to you, think of it as a prism of light that goes through time, space, and dimension—so that could be said of any object on your Earth. The pyramids have been slowed down to such a degree that they have solidified into this noteworthy structure visible to the human eye. But when we were first constructing them, we referred to them as monoliths. Do you know what a monolith is? If your hearts and minds are not aware of a monolith, I might simply ask you to quiet your collective minds and break the word down: mono-lith. So that’s how we began our mission about the pyramids in Giza. They were not of solid form; they were almost holographic chambers and they conducted tone—that’s the very first way that I know that we were able to bring those currents of energy to your planet. We brought them in an energetic form of crystalline, though there were other holographic material fragments in the construction of the pyramids. They were first energy without solid matter; this is what we’re trying to say. The great mountains on your planet were first energetic movements that finally took form, so the same is true of what you might call the man-made, unusually-made, or extraterrestrial-made pyramids in the Giza Plateau. They were planned there to be a landing strip, you might say. They still function like that. We can come back in a moment and explain why they were positioned where they were. About the holographic nature of them—how did we do this? With our telepathy, we created sound chambers. That’s what they are still encased with. They were and are encased with holographic tubes. 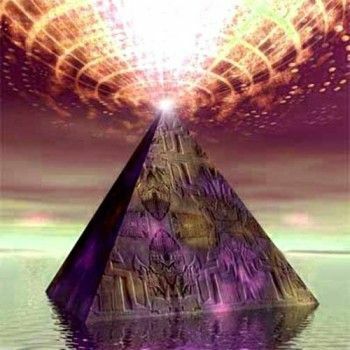 Every pyramid, and we can look at each one, is different in the way they work together as a vibrational whole, like notes on a musical instrument. Even sound waves have different wave lengths, and the wave length allows for something to be seen, witnessed, or heard. If there is only one wave length, there is only particularly one received. Each of them has its own resonance, vibration or tonal quality; together, they play a symphony, and they still play a symphony of sound to us. It’s a symphony that we observe, but don’t monitor. Monitoring implies everyone is being watched; there’s plenty of that conceptually that we are trying to do our best to eradicate. Let’s just say that we observe the pyramids' tonal quality and we observe this energetically, or telepathically. Sometimes they blink in unison for simplicity, for lack of any other reason. Sometimes we command them to vibrate to send off certain healing frequencies. So, it’s not all that they are the chambers that are eliciting the healing. Sometimes we have programmed them. Kelly: How were the pyramids built? What technology was used? When the command came from Source that Earth was wobbling out of orbit and that help was needed, we were able to summon about 15 trillion to maybe 16 trillion star warriors to come together with us in an instantaneous secondary moment on Earth, and we made the intention that the first pyramid would be purple. Let’s just say violet—somewhat indicative of the violet flame— though it was a different color (not a spectrum on Earth). By the way, one has diminished, one has vanished, one is more than you presently see. It served its purpose. You are asking specifically how? Kelly: Did the stones go from place to place? We have seen these elaborate drawings of pulleys and animals and man and machine. Was it a lever system? How was it done? Did man have a role in the contribution of this? chosen. It would have been too much had that all been done at once. So, in the transition between what you might say the 29th dimension down to the 15th, slowing down to the 11th, down to the 9th, down to the 4th dimension—these things came to be one at a time. Have you ever seen a shape shifted, like a petrified forest? In much the same way, these forms became petrified. Does this make sense to your mind? That the energetic forms were there so long that they eventually became “real” in the dense field you live in, so they could anchor into different grids, the landing space. May I continue? Kelly: Theos wants to tell us that the top of the pyramids (and by the way, they can still do this)—a lot of times they will fly with their ships over the no-fly zone because they can intercept the warheads and other weapons not healthy for our planet, and go around there. They will fly their ships to help battle that matter. But he wants to say that the top of the pyramids open. Theos: That is why you will find a pyramid within a pyramid. If you know something about sacred geometry, or the sacredness of geometry, there are pyramids within a pyramid. That is how we see it—so the eyes might see an outer form, but when we see them as holograms, depending on which pyramid we are looking at, there are anywhere from 16 smaller chambers to upwards of 30. There’s a reason for this. I might just focus on the reason for one (small one): they all work in unison. Like their frequency to sound waves, collectively, or light waves, depending on what spectrum of light is emitted. That’s what you’re able to see. They all have a spectrum, so if you think of the pyramids in much the same way, each has a different spectrum of harmonic convergence; it can be calibrated to tone. It is continually calibrated to tone. 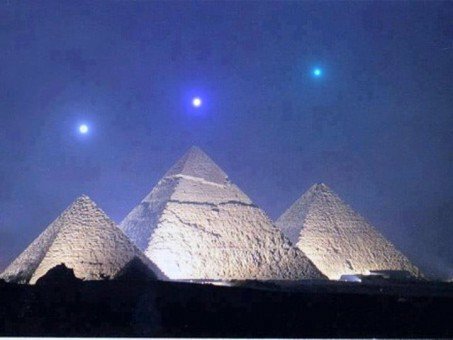 Those pyramids are monitored instantaneously. Almost at any given moment on Earth. The tone and calibration has changed over earthly time. My presumption is that when it is known that your world is in an eternal state of bliss, as has been promised to us, all the known pyramid structures above ground will be banished. We will remove them just like we created them, along with God Mind. There will no longer be a need for them. So, within the top of the triangle of the pyramid there is a very complex form within them, like a beehive. From the outside, if you have looked at any hive, it can be very deceiving. What goes on inside of a hive is far more complex—busy, busy, busy! What is happening for your understanding, even if human beings are in there, is particles of what I’d call advanced electrons, protons, and quatratrons are firing back and forth. Ricocheting off the inner columns to create tones, and the purpose of the tones is to help alleviate suffering. That is the major purpose: to relieve suffering, as they stand presently. As an example, we are happy to look at more of these if it helps you have an understanding. With the top of the pyramid form opened up like a lid, our ships can be a softer shape and shrink down. We can send small ships and enter into the top of any pyramid at any time or moment. We will explain in a moment if there’s a desire to know. Other times, we signal the top to raise. Well, you will say nobody has seen these, but it depends on what your eyesight is like. Yes, there are those who have seen the top flip up on a hinge as an unmanned ship comes in. Sometimes they come to make adjustments. We can make adjustments without sending a ship, but sometimes it’s best—like you on your planet, you may want to be up close instead of far away. That’s not the only reason why an unmanned ship might go inside of the pyramids at Giza. That is what has been done on occasion; it’s not a frequent thing. There are forces at work that would like to disrupt them and other monoliths that have been sanctioned in the Earth dimensions for the healing of all those that dwell there. Kelly: I am curious—all of the information many of us were taught about the building of the pyramids where animals and elaborate machines places these stones, was it faked? Theos: I am not a believer in the idea of false, the idea of right or wrong. Some things have been manipulated and others have been kept from your truth to minimize our existence. As I said, once our forms materialized and became a dense enough nature, they had a vibrating quality. If you can imagine a humming, many of early man in that region heard them hum. So, mankind was curious. His curiosity asked mankind to explore and see, as it has revealed many wondrous things, sometimes destructive. In this instance, mankind became curious what these forms were. Some of what you see and read is accurate, but much has been omitted (as much you have come to read and see about many things has). There are texts and documents about the Golden Seal. Well, the Golden Seal is a very sacred object or amulet, more than a sacred doctrine. We have a long atoning name for it in our dimensions, but it doesn’t translate easily to Earth. It contains the embodiment of many of our truths, the star truths that those who still want to keep the veil of all, the veil of much, away from mankind. It’s sort of like a time capsule, but is beyond a time capsule. Encapsulated in the Golden Seal is information from all of time, in all dimensions, in all of matter, about the realities of matter, and most of the matter. This Golden Seal summarizes the history of the Earth. So, yes, there were slaves, and slaves were held, as we know slaves were to do work, but it wasn’t because they built them; it was man’s excuse to enslave man. It wasn’t the first time it has occurred and won’t be the last; there is still a battle to be won over this. Over time, some of the structures needed some work, but most of what you see and know was manipulated. Even if we get past the ideas of who originally placed them, that one of the pyramids is no longer there, that they were not created by the hand of mankind, and that there is this magnificent disk that is moved with secrecy from sacred place to sacred place, protected beyond protection for now, until the day when the Seal will be revealed and much will be made known about things, some of which is threatening to many of your world today still. I do not have information about when the golden disk will be opened. Rosalie: One time I was in Mt. Shasta and I went to help some psychic kids, and we did a little exercise and went in as spirit to the Mt. Shasta opening. It had a very cold atmosphere and this big huge owl was protecting and monitoring the area and, in fact, the owl asked what we were doing there. We were at the point where we could see the lava, and it was really cold on top of the lava and this owl was there and asked, “And what are you kids doing?” “Oh,” we said, “we're just having a psychic class, checking things out.” He said, “OK, that’s fine.” We could actually see these things that looked like prehistoric dinosaurs or something swimming in the lava, and they had like a cap on the lava because they didn’t want it to erupt. Do all pyramids have lava at the bottom? King Theos: Some do, some don’t. I can tie these matters together if you’d like. Nothing operates in a vacuum, as the expression on Earth might be. So, imagine beams of light underneath the monolith that we’re calling the Giza pyramids, and imagine beams of light energy coming from sacred portals such as Mt. Shasta, Lake Titicaca, the Bolivian highlands, Stonehenge, or Mt. Vesuvius—other forms that are physical forms that minds or hearts might gravitate to for their beauty. If it’s a beautiful natural wonder, that it has healing properties associated with it by its natural wonder. So, from Mt. Shasta, as this soul was describing, let’s imagine one beam of light. Beams of light penetrate, depending on what is vibrationally underneath the area. Let us just say, if the soil is contaminated by hate, greed, or not; eventually, through this tunnel of light—very similar in your minds to the constellations up in the sky, if you have ever looked at the beautiful wonders and wondered about the origins of man, and you’ve seen the most magnificent connection of planets and asteroids—that’s what it looks like to us, multiplied by 100 energetically inside the Earth. Energetically, everything to us is a form that has full volume. From Mt. Shasta, with a simple beam of light, that simple little description she was kind enough and perhaps brave enough to share about the magical beings in her experience. The same holds true with every other portal—particularly, what holds pure civilization, light forms, all types of wonder, all of God’s original creations that were to be above Earth—holding the vibration of light. Some are in time capsules or healing pods. That is why some of you with clairvoyance might see forms with an auric field but it looks like a luminescence. It is actually a healing pod, seed pod, seeded matter—so what she was describing was seeded matter. Where did it come from in that particular instance? Arcturus, some of it. Other seeded matter might have come from our home, or from far distant galaxies such as Persimonne, Damascus, or many others. There is a continual heartbeat that connects what many may not see. Many of you can feel what I’m talking about. This is why we say things like restoring grids, restoring thinning grids, restoring the membrane and energetic matter of the Earth. When that energetic matter, that tissue that connects Mother Earth to these sacred monoliths—they could be mountains, they could be huge bodies of lakes, they could be inward mountains, the initial conceptual thing of Stonehenge or the like—those vibrations are interconnected and are made stronger when those of you are on the Earth plane. We do need help, that is why many of you chose to incarnate at this time—to be of help. Hundreds of thousands of you have chosen to incarnate at this time to help in any way you could, and still can, to be sure that the ascension model that’s been laid out in front of us here will be complete, swift, and pure. Every time you think that you might feel a vibration, trust it, and know that it is a vibration, like your veins or arteries in your body—they are either transporting energy to something or away from something. For now, I think I will stay on the topic to try to address, at least in some brevity, the teaching about the pyramidal shapes in the ocean and what value they might have to mankind, what value is placed upon them, and what type of help, if any, is needed from souls at this time. Kelly: Theo, can you describe yourself? We’d also like to know what we can do to help in the ascension process. And what did the Sirians have do as it relates to the Egyptian civilization? Theo: I am about eight to eight-and-a-half feet tall. I have hair on my head, two legs, two arms; you might find me to be rather thin, lankly I suppose you would say, by the nature of my frame. Our inner bodies are different than your own. We have a projected lifespan compared to your Earthly lifespan presently, from about 150 to 350 Earth years. Though we do not measure our time in years at all, with very little if any aging as you might say. We can live unaffected, although we have a maturity process different from your own; it has more to do with vibrational maturity. Kelly: What complexion is your skin? Theo: My skin is kind of a pale greenish, between beige and olive green. Kelly: Kindly tell us about the Sirians and the creation of the pyramids in the ocean. Where they are, if they’re still there, and how we can work with them, as the alchemists that we are, to help the world ascend? Theo: I like the idea of dividing things into numerical order. So, in your minds, imagine this numerical order. I will say the numerical order: 5-5-999987979977777. That’s one order. A second sequence (even faster, 28 times): 9999999999999999999999999999. The third sequence—these are pillars of truth, the harmonic convergence equivalent in the Sirian light language of the pillars of truth: 7777777777777777777777777777777777. Kelly: How would we work with these numbers if we can’t remember them? Or do we work with them? Are these the triangles? Are these the pyramids? Theo: This is an example of what we would have transmitted telepathically to place the pyramids that are for harvesting and colonization. Think of it as you would harvest crops. The purpose of harvesting pyramids (we see them as crops), is either as conductors of electricity, currents of light, currents of tone, or currents of frequency—currents, currents, currents. We have been harvesting colonies on your Earth planet for a very long time. So, you could grow colonies of pyramids—this is to answer the question, “what could we do?” You could grow, help us grow new colonies of pyramids. Imagine in your mind, if you’re not already: these pyramids look like tiny, tiny, very simple triangles down in the bottom of the ocean floor. What ocean? There are many great oceans of your planet and they will be great again, even though they have been polluted. We know so very much about them and so very little. This is being done through a myriad of ways also. One of the ways the water frequencies are being restored is these colonies of pyramidal forms. I like the word harvesting because that’s what we’re doing. We’re growing colonies that are 12th dimensional or higher in vibrational nature; interstellar colonies under the Earth's surface to help the ocean to be able to sustain herself. The reason this work could be done—needs to be done—is just like anything; when we harvested in the past, there used to be many pyramidal colonies in the majority of your oceans. Most of your planet was covered in interplanetary glacial water—crystalline you might say—and these crystalline pyramidal conductors of harvested colonies—think of them as interstellar, intergalactic space shields, solar shields, vitamins, or nutrient packs (these are Earth analogies or things you might say)—this is what they were to do, to help things grow within the womb of mother Earth, the appropriate plankton, the appropriate small fish—things of this nature. It was God Mind's plan to create this, and when the galactic wars began, those that fell outside of grace started destroying a bunker, we could say. It’s no different than—unfortunately, in your world as things are now—as if mankind were to destroy anything. It’s a similar thing, only that what you may not see or know not to be true, would be real. So, harvesting these healing pyramidal monolithic structures, tiny as they may be in actual physical form, if you were go down, down to the depths of the major oceans in your world (to put this matter in relative proximity), some are the size of your average coffee cup—not very big. So, these colonies can number into the thousands or trillions, depending, and others have gaps where they have been blown or obliterated away. Even without knowing, just visualize with your powerful minds a healthy colony of beautiful, brilliant, effervescent, glowing, vibrating, triangular forms, and that they are in colonies to form a monolith. They are serving a huge purpose and some of them have been destroyed. Your work is imagining them whole, and imagining them in your mind to be a colony or grouping. Go into a meditative state and ask your Higher Self to show you what colony needs work. It will be shown; if not, ask again. I’m not going to tell you which colonies needs work—you are far surpassed in that, human. There is no wrongness with this work. Ask what colonies need work. If nothing comes to mind, be even more loving to yourselves, call on me if you like, call on the doctors of the Sirians, call on the lords and ladies, call on Theos and ask us to help you form the thought consciousness to help restore these. You can see them like solar panels on your house, and the wind comes by and blows one off—it’s very much a similar thing and they still serve a purpose. They were there on the first day of creation and I suppose they’ll be there for all the eons of time yet to come. But some are missing, some have lost their charge, and so your thought energy behind this would be just imagining all the goodness you have in your hearts and minds and souls and you will be recharging them. Rosalie: Pure Source is connecting directly beyond the holographic programming that continually tries to overtake us? Kelly: He is saying “Yes.” What you call Source may not be what she calls Source or I do. If someone wants a little more insight from Theos about where to send them, you can send that healing thought energy along the coastline. He showed me the left side of Africa, which is all different countries—all along the coast, up and down—is where there are holes in the grids for these triangles. He’s also saying they help regulate the weather; they are weather stabilizers. Theo: And so, because much of your world’s weather is being manipulated and has been manipulated, this is why this work is of extreme importance. Kelly: All the major coastlines are where these chambers need work? Theo: Yes, with the exception of near the fault lines; they are well protected by a whole other battalion, too complex to go into now. Kelly: We want to thank you, King Theos. Thank you for sharing your valuable insight to increase our awareness and so that we can be more helpful during this time of the Great Awakening. 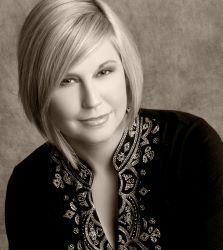 Kelly Hampton is a an international teacher and healer here to anchor the Christ grid of Ascension. She is also a renowned author, angelic, channel of many light sources, a gifted medium, animal communicator and energy healer. Since 2010, she is also the founder of multiple 5thD ground-breaking healing systems given to her by Archangel Michael including STAR HEALING INTERGALACTIC ENERGY™, Star Healing Equine™, Star Healing for Small Animals which some are calling THE most powerful healing systems on the planet. She is also the founder of Ascended Spaces™ from Archangel Michael—the angel’s answer to feng shui--for creating abundance in our New Earth. She certifies practitioners in all of these modalities worldwide with practitioners currently in six countries. She is also the founder of DOMINION, the new astrology-astronomy system for the New Millennium from Archangel Michael since 2015. She is the author of INTO THE WHITE LIGHT: THE REVELATIONS OF ARCHANGEL MICHAEL, 2012 AND BEYOND: THE TRUTH FROM ARCHANGEL MICHAEL, and her latest release THE BOOK OF ANIMALS. Through her other intensive training workshops and online programs, telesummit appearances, spiritual retreats and audio series, she elevates the human and planetary consciousness.